How to choose a best suitable rotary discharge valve? Rotary discharge valve a compact mechanical device for continuously discharging bulk powders or granules under gravity flow. By definition it is the simplest of machines having only one moving part (ignoring the drive); a multi-vane rotor revolving in close contact in the housing and where the housing has an inlet at the top, and an outlet at the bottom. 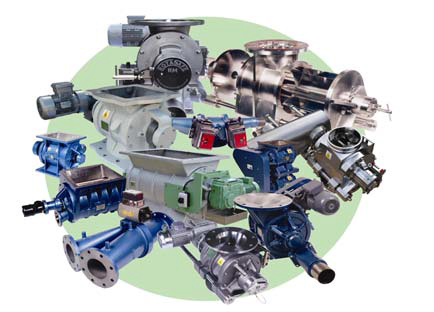 As well as satisfying any one or any combination of these needs, the valve also has to overcome any adverse characteristics of the product being handled. To complicate matters further product characteristics can be altered by the duty conditions which are not always stable. Notwithstanding the above some 60%+ of applications can be readily satisfied from standard components and, if necessary, the inclusion of common additional features. The remainder tend to require specialist input in order to ensure satisfactory performance and service life. In all cases, technically competent suppliers will examine the duty carefully to ensure that the right unit is offered, and to be sure that any special considerations are identified and provision made.